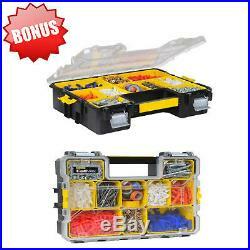 Organiser Waterproof Storage Box Screws Nails Stanley 197518 FatMax Deep Pro. We are open to answer all of your questions! The Stanley 197518 FatMax Deep Pro Organiser has 10 removable storage compartments, providing storage for small parts, components or accessories, which can also be stacked together for use outside the organiser. Made from polypropylene, the organiser has a virtually unbreakable lid allowing the contents to be viewed easily and features a waterproof seal that not only prevents water, but also rust and foreign particles from entering. A plastic handle with textured grip allows the organiser to be moved comfortably, while the organiser’s lid has been specially designed to ensure that the compartments are held securely in place and fastens with two metal latches. For added versatility, multiple organisers can be clipped together using the side latches for easy transportation. Lid Locks Compartments In Place. 2 Rust Resistant Metal Latches. We do NOT accept P. BOXES – please provide a physical address! Key words :Organiser Waterproof Storage Box Screws Nails Stanley 197518 FatMax Deep Pro. Thank you for your attention! The item “Organiser Waterproof Storage Box Screws Nails Stanley 197518 FatMax Deep Pro” is in sale since Wednesday, August 8, 2018. This item is in the category “Home, Furniture & DIY\DIY Tools & Workshop Equipment\Tool Boxes & Storage\Other Tool Storage”. The seller is “seyko_store” and is located in Manchester. This item can be shipped to United Kingdom, Antigua and barbuda, Austria, Belgium, Bulgaria, Croatia, Cyprus, Czech republic, Denmark, Estonia, Finland, France, Germany, Greece, Hungary, Ireland, Italy, Latvia, Lithuania, Luxembourg, Malta, Netherlands, Poland, Portugal, Romania, Slovakia, Slovenia, Spain, Sweden, Australia, United States, Canada, Brazil, Japan, New Zealand, China, Israel, Hong Kong, Norway, Indonesia, Malaysia, Mexico, Singapore, South Korea, Switzerland, Taiwan, Thailand, Bangladesh, Belize, Bermuda, Bolivia, Barbados, Brunei darussalam, Cayman islands, Dominica, Ecuador, Egypt, Guernsey, Gibraltar, Guadeloupe, Grenada, French guiana, Iceland, Jersey, Jordan, Cambodia, Saint kitts and nevis, Saint lucia, Liechtenstein, Sri lanka, Macao, Monaco, Maldives, Montserrat, Martinique, Nicaragua, Oman, Pakistan, Peru, Paraguay, Reunion, Turks and caicos islands, Aruba, Saudi arabia, South africa, United arab emirates, Ukraine, Chile. This entry was posted on Friday, March 29th, 2019 at 5:38 pm	and is filed under organiser. You can follow any responses to this entry through the RSS 2.0 feed. Both comments and pings are currently closed.